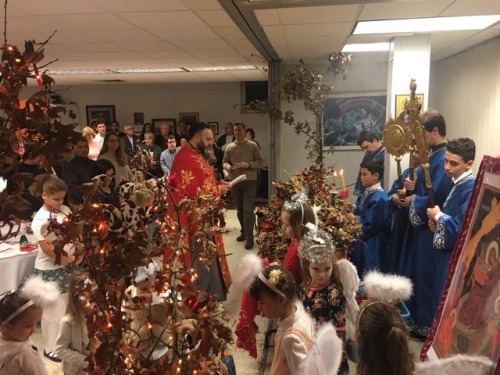 On Christmas Eve - Sunday, January 6, 2019, the Church School of St. Stephen of Dechani, Serbian Orthodox Church in Columbus Ohio; organized a Christmas Program. The Program was presented at the parish social hall following the Vigil service and traditional Badnjak blessing. 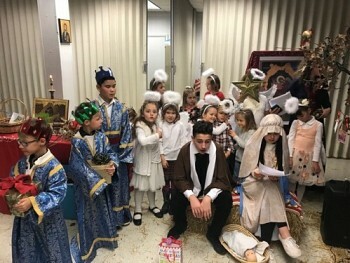 Program hosting was done by the Youth Group members: Myra Grahovac, Julie Sanchez and Nikolina Kisin, while younger students participated in Christmas play, poems recitation and singing. During the program all parishioners in attendance enjoyed a delicious dinner prepared by Church School teachers and students. Every year Church School students and teacher prepare beautifully decorated and arranged Badnjaks for parishioners to take home after they have been blessed. All the proceeds from dinner and Badnjak donations go to Church School to support their yearly projects and activities. Parishioners have always been very generous in supporting our Church School. The School teachers: protinica Dejana Kisin, Katarina Sanchez and Katie Maragos worked very hard to make sure that everything is done in the best way possible. The program was exceptionally well prepared and presented to delight of all in attendance.